Pampering pets on Valentine's Day. It is often said that we are a nation of animal-lovers so, on the day of the year dedicated to love and companionship, how do us Britons fare? 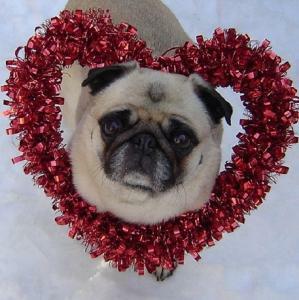 Studies have suggested that nearly a quarter of UK pet owners will be splashing out on their pets this Valentine’s Day, with roughly 16% intending to buy their furry friends a card or present, and 6% actually purchasing gifts for their pets to give to them! Findings from 2013 show a total UK expenditure of £54 million on pet presents and an average spend of £9 per animal, although there have been numerous examples of owners spending well in excess of this amount for their cuddly companions on Valentine’s Day. Diamond-encrusted collars, designer dog coats and lavishly-styled beds and kennels are just some examples of the types of gifts being given. Another surprising statistic is that the biggest Valentine’s spenders are amongst the 18-24 year olds, with the over 55’s being five-times less likely to buy their pets a present on Valentine’s. 1 in 10 young owners have admitted to treating their cat or dog on the big day, with some even saying they have cooked their pet a special meal! Across the globe in America, total Valentine’s expenditure is considerably more, with roughly $800 million being spent on cards and presents for pets every V Day. This includes novelty clothing, treats and pet-friendly cakes, jewels and ‘dog diamonds,’ signature perfumes, four-poster beds and even Swarovski crystal clip-on earrings. It is also rumoured that one devoted dog owner gifted his pooch a $30,000 outdoor dog house, complete with lights, running water and air-conditioning! While we don’t all have that kind of disposable cash to needlessly lavish on our pets, it is the little daily sacrifices that truly display how much we adore them. As a nation of animal-lovers, it is no surprise that a recent study revealed a third of us would rather go without than have our pets do so, and would be reluctant to make cut-backs to things such as pet food and everyday creature comforts like toys and bedding. In fact, even during the economic downturn, the UK pet industry has seen little reduction in demand, with premium brands of pet food still performing well, just as treats, clothing and health supplements have continued to fly off the shelves. This just goes to show that while we certainly love our pets and spend a considerable amount on buying them gifts, not just on Valentines Day but for birthdays and Christmas also, we invest in their care year-round - something which possibly demonstrates our love much better than a £30,000 dog house!